A billion bottles of beer on the wall, and counting. 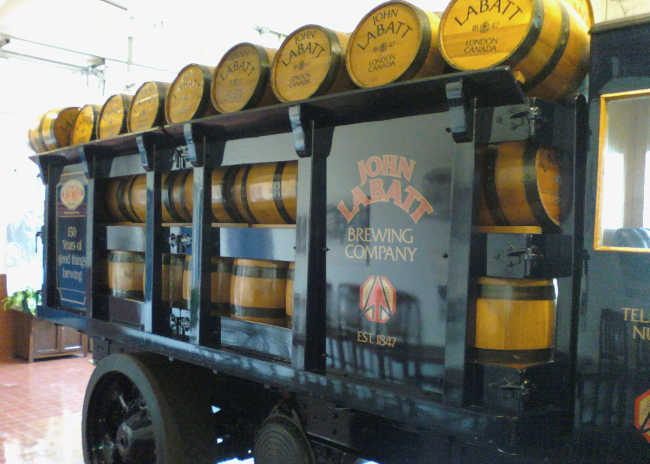 In 1847, John Labatt began brewing beer at Simcoe St. in London and in the first year, the brewery produced 1,000 bottles. Jump forward to the present, the Labatt Brewery, still at the same location, produces 1 billion bottles of beer annually. If you’re curious about what it takes to produce a billion bottles of beer, and the storied history of the Forest City brewery, then you have to come take the Labatt Brewery Tour. The tour starts off in the Amber Lounge. It’s a great space with Labatt memorabilia from the 166 year history of the company lining display cases and a full bar to sit and sample some brews, but we’ll get to that later. After putting away the cameras, no photography allowed on the production floor, and putting on some protective gear, we head out to the start of the brewing process. The guided tour took us through the full brewing process and nearly the entire plant. Starting with the cookers, mash mixers, and kettles, including the one reserved for just Budweiser because of its unique process, the knowledgeable tour guide relayed all the steps of the process and how each piece of machinery did its part. Then came the walkthrough of the yeast, fermentation, aging, and filtration process; the aging tanks are quite a sight not just because of their size but also because of the effort it took to get them to the brewery. Next, we arrived at the packaging facility. As you’d imagine, with a facility this size, there’s quite a lot of automation, and we had a great vantage point to see it all. The bottle washing, filling, labelling, and packaging is done by an impressive array of machinery and with great precision. As the product portion of the tour comes to a close, it’s easy to see the care and attention to detail that goes into the brewing process at Labatt. Once the sampling was done, the final portion of the tour took us to view the 1947 Streamliner delivery truck and its 1919 Keg Truck. Both vehicles have been restored to near new condition. There’s some great stories and history to go along with the vehicles too but I’ll leave those for the tour guides to relay, wouldn’t want to spoil it for you. 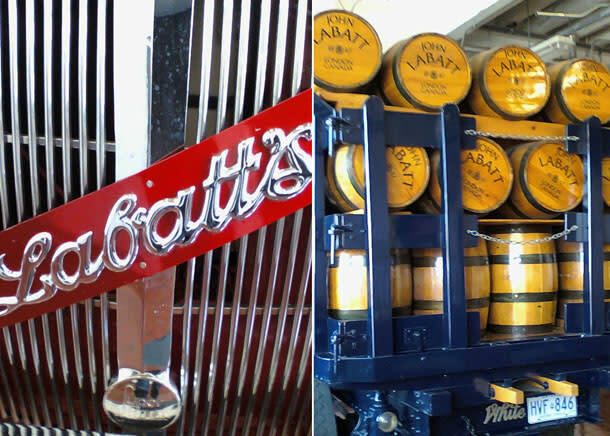 The Labatt brewery tours run all year long and must be pre-booked by phone or email. The cost is $10 per person for the tour and it’s definitely great value with a fully guided tour, samples, a souvenir t-shirt, and even a coupon for the Labatt Retail store included. You can’t use the coupon on beer but there’s lots of cool items to choose from. Whether you’re a fan of local history, engineering, or just beer in general, this tour is an absolute can’t miss. I’ve already done it twice and I’ve picked up some new information each time; not to mention enjoyed the delicious samples.